Peachpit's "Apple Training Series" is generally an outstanding product line. However, there are two distinct branches to the line: knowledge and certification. This book isn't designed as much to teach you about OS X Server (Tiger edition) as it is to prepare you for a certification exam. Nothing wrong with that, it just not terribly practical for real world operations. While I haven't taken the certifcation exam, I suspect this book prepares you well for the exam since it's the "offical" curriculum of the Apple Training and Cetification program. Similiar to other test prep books, there are goals and reviews. In particular, the book breaks down the learning into chapters with time estimates, which is helpful in preparing your learning process. The included CD has sample files to go along with the detailed and expanded exercises. The book takes you through the basics of setting up a server start to finish along with giving an overview of the rich feature set found in OS X Server. Unfortunately, simliar to other test prep books, the book doesn't arm you with the skills necessary to properly maintain and configure a Tiger server in the real world. There is no troubleshooting guide nor much practical advice on do's and don'ts of server setup. After reading this book, I'm relatively confident I could pass the exam, but I do not feel confident I could configure or maintain a Tiger server. Nonetheless, this book is a good first step in learning OS X server. You need no prior knowledge to start using this book and to at least get a test server set up. Overall this is a good book for beginners and/or persons trying to get certified on OS X server. The book level from Peachpit says "Intermediate/Advanced". I disagree; this is strictly for new users. If you will be maintaining a OS X server, look elsewhere for a support guide. Anyone who's setup a OS X server will be annoyed by this book. I am writing, obviously to cancel my account with your company and wish you delete any and all information you have on file about me. As you know, I ran into problems with too much spam, which is ironic, since people who sign up with your company have too much spam to begin with. You threatened to shut off all my email for receiving too much spam (over 400 a day) and when I asked for help you blamed the fact I had a business domain--though that wasn't the domain having the most spam problems. My emails asking for clarifications were responded to with trite and unhelpful boilerplate responses. Firstly, I want to thank you for teaching me some valuable lessons about consumerism that I apparently forgot, otherwise I wouldn't have signed up for your “service”. I'd like to review them, if only for myself and others on the Internet to learn not just to stay away from your company (I do wish I knew who “you” were), but to remember these valuable lessons. Every experience, no matter how horrible, can be learned from. That's why I'm posting it to my professional blog. I knew I was in trouble from the start. Never purchase something in haste. I was getting “joe jobbed” on one of my domains and my spam software was getting overwhelmed. Research indicated you won awards…but that was two years ago and there was little critical review of your company since. That's a sign of trouble. Good products continue to win awards. Your website showed some “key” markers of trouble ahead. When I went to the contact section, no toll free number was listed. Not a deal-breaker, but seems strange. No fax number listed. That does seem strange in 2007! What should have told me to browse away was the fact that nowhere on the website is a person listed. No owner, no message from the CEO. Heck, even your media contacts were unsigned, and media people are known to be self-promoters. During the sign up process, I made some assumptions. Your terms “Personal accounts are intended for use by individuals who receive a modest amount of daily email and have a download/filter quota of 400 emails from each external account per day” When I ran into problems with too much spam, I made the assumption that this “filter quota” only applied to good email and not spam. It's logical that a company that you pay to remove spam wouldn't charge you for too much spam! Isn't the whole purpose of signing up for a spam blocking service is because you…well.. have too much spam? Then “support” told me that your product didn't work well for business domains. In spite of the fact that my business account only received 15-30 legitimate emails a day and my personal account received much more (mother in law sends me way too much information! ), you considered it a business account and suggested your expensive corporate solution. More importantly, you didn't state the consequences of having too much spam. You'd shut off my email for 24 hours! Ouch. Why didn't I ask “what would happen if I ran over the quota?” Stupid stupid stupid. The ambiguity of this term should have told me to walk away…but alas, I did not…and in the end that's my fault not yours. I didn't even check your BBB rating! But really, a spam service that penalizes you for too much spam? Am I on Candid Camera or what? Lesson 4: Ambiguous terms and terms that don't state the consequences should be deal breakers. But again, I signed up. First few days during the trial period your web site repeatedly went down. I was told this is rare, but got a quick response from “support.” Hmmm…rare…I already missed three alarms, so why stop here I guess. Not only that, the emails were unsigned. Even if it's signed with Americanized foreign names, rarely do you get emails from a support team that don't even mention a first name. Failed to learn this in Lesson 3 and continued on. Lesson 5: Unsigned responses from service professionals is a clear sign of trouble. My problems continued. Spam emails kept slipping through your filters. “Support” 's response was to contact my ISP. When I tried that and told you they couldn't assist, you blamed them and then you again blamed me for using it your service for work purposes. So my spam service wasn't working and I was constantly under the threat of being shut off. Lesson 6: Blaming the customer or other vendors should be endgame for a business relationship. Lesson 7: Don't beat a dead horse. If it isn't working out, move on. And the final lesson. While I was in the process of moving my emails back to my servers, your company actually spammed me about its “kid friendly” email! Now this is personal, figuratively and literally. How dare you spam me about your services…when I'm paying you to block the spam! Forget Candid Camera, this has gotta to be Americans Funniest Home Videos. I felt just like the guys that got hit in the groin. Ouch. So in sum, I'm canceling the service, ending the relationship, and warning others. While your service is terrible in every respect, it's my fault for not seeing the warning signs. As they say “It's me, not you.” Continue doing what you do, if someone is foolish enough to continue with your service after all these warning signs that any good consumer should recognize, it's their fault not yours. Thank you for the refresher course in staying away from Internet scammers. Or maybe this was all a big joke. Only my credit card bill will know for sure. One of the latest gee whiz inventions in the past few years are the flurry of USB to IDE/SATA adapters. While technicians like me find them indispensable, other "mere mortals" can find some real handy uses for these gems. 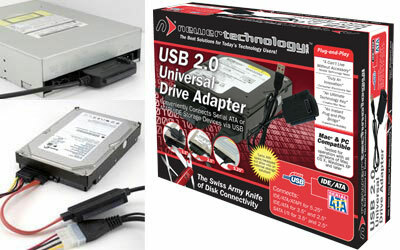 Storage leader Newertech has constructed one of the best USB bridges out there: the Newertech Universal Drive Adapter. While Newertech's name is familiar to Mac enthusiasts and historians (including going bankrupt and leaving some rather upset customers), it's only connection with that past company is the name and hopefully tradition of quality. So far the newer Newertech is carrying the torch well. Newertech and Otherworld Computing are sister companies, so OWC is the main place to buy the "new" newertech stuff. The Universal Drive Adapter allows practically any hard drive (or optical drive) to be attachable to your current Mac via USB. Because the hard drive isn't protected in a case, this is not a long term solution. If you want to use a internal hard drive via usb (or firewire) over a extended period of time, purchase a quality external case. I've gone through quite a few of these usb bridges. Beware and be aware of awfully cheap USB bridges. They too often break due to inferior plastic and one I owned actually started smoking (didn't exactly give the customer a great sense of confidence): in other words, awful. Cheap and trusting data often don't go along well in the same sentence. I'm impressed with the quality of this Newertech device. It's well constructed and has withstood months of heavy use by me. Other World Computing is great about standing behind their products, so I wouldn't trust my hard drive to anyone else. USB bridges are primarily used by technicians to temporarily attach a hard drive or dvd drive to another computer for backup or data transfer. So you aren't a tech? No problem. I suspect there isn't a reader out there that doesn't have at least one old computer or hard drive lying around. You probably left it in the closet because you know that you have personal data on it and didn't want to just throw it in the trash or you are simply afraid you might need the data "at some point". Now you can simply pull the hard drive out (OWC has great videos on their website on hard drive removal) and use it on your current Mac. A backup of your old computer is easily accessible should the need arise. By the way, you can easily use hard drives from Windows machines on your Mac...or even use this on a Windows machine. Perfect for switchers....pull the hard drive out of your PC and attach it to a Mac. What I think is the best use of those old hard drives, however, is backups. Take an old ten or twenty gig hard drive and hook it up to your Mac and backup your current Mac. Often that hard drive will hold more data than a USB flash drive and DVD combined. . If you have a Intel based Mac, you can even boot off a USB drive. If you rely on your Mac, you owe it to yourself to have some way to boot your Mac in an emergency. Since you only need it in emergency, you can save yourself a few bucks by buying a cheap IDE drive and keep this close at hand. Every IT department should have one of these (I do!). Actually, they probably do, but not made by Newertech. When your existing one breaks for the fourth time this year, spend a bit more and get a quality one. However, small office/home office users with older computers lying around can save space and put that valuable storage space to good use. In the Matrix, the character Neo represented a slick confidence that somehow made him master of everything in the quasi-reality construct the movie series is named after. Of course, it's also named after the substance the case is made of: neoprene. Yes, I'm obsessed with keeping my Macbook is tip top shape. It's the first new laptop I've ever bought. I've tried hard shells and fabric sleeves. Each have their advantages. Hard shells work well to protect the computer, but aren't always that pretty. They also can get scratched up over time. Mine after about 9 months began to look like one of those Nanos everyone sued Apple about. I then used a fabric sleeve. I liked them, and I continue use them on occasion. The problem with a fabric sleeve is you forget to put them back in. The NeoCase, just like the character, seems to be the missing element that combines them both. The fashion sense and durability of a fabric sleeve, combined with the protection of hard shell. It is the one that will bring balance to the force. Oops, wrong movie!